Akaavi Spar was born into a respected Mandalorian clan and became one of its finest warriors. She killed her first foe--an abusive Abyssin mercenary--at the age of eight using an improvised flamethrower. This victory earned her the nickname "firehand" among her clan and marked the beginning of an impressive career as an Imperial bounty hunter. Akaavi captured and killed all manner of targets in her youth, from career criminals to Jedi. When her entire clan was framed for crimes against the Empire and executed, Akaavi alone survived the brutal purge--but her outlook on the galaxy changed forever. With no connection to her Mandalorian heritage, she became a wandering mercenary loyal to no one. Ak'ghal Usar, the Last Lord of Urkupp, is a being out of time. Seeking vengeance for his fellow Dashade who were eradicated in the Great Sith War, Usar traveled to Yavin 4 in the hope of confronting his people's killer, only to be trapped in stasis instead. Now, centuries later, his original target is gone, as is the Sith who imprisoned him--Valkorion. Still hungry for vengeance, Ak'ghal Usar is willing to join forces to exact his revenge on the best targets remaining to him: Arcann and the forces of the Eternal Empire. For five notorious years, the pirate Andronikos Revel terrorized Republic and Imperial space alike as the captain of the Sky Princess. Known for his sharp temper and sharper flying skills, Revel was one of the few pirate captains to serve as his own pilot. His piracy career was cut short by a strange mutiny, however, and he was abandoned to the Imperials who had been hunting him since he'd raided a ship carrying valuable artifacts. After a year in Imperial prison, Andronikos Revel was let loose. He has been meticulously hunting and killing the mutineers who betrayed him ever since. A natural soldier, Aric Jorgan enlisted in the military at an early age and quickly distinguished himself as a talented marksman. He earned a reputation as a demanding, unwavering leader and patriot, and there is little he wouldn't do to protect those under his command. This same dedication served him well when he assisted a young lieutenant in rebuilding the famed Havoc Squad, winning major victories for the Republic. When his commanding officer went missing in action at the start of the Eternal Empire's invasion, Jorgan assumed leadership of Havoc Squad. He was conflicted: he loved the Republic but disagreed with its willingness to kneel to Zakuul. Determined to protect the Republic in spite of itself, he began leading Havoc on unsanctioned strike missions deep in Zakuul territory. A twenty-year-old Togruta Padawan, Ashara Zavros descends from a long line of Force users. From an early age, she has aspired to study the Force and become one of the best Jedi the order has to offer. Ashara came to Taris to train under Jedi Masters Ryen and Ocera, whose philosophy is that Padawans best learn the travails of using the Force through firsthand experience of the galaxy. In Ashara's case, the Masters brought her to Taris for two reasons: First, to teach her compassion amidst the destruction that had occurred there and warn against the dangers of pride and the dark side. Second, to complete her trials by helping to drive a dark ghost from the ruins of a Jedi enclave. Infinitely curious and adventurous, Blizz always felt confined on his native Tatooine, bored by the endless rolling dunes and limited selection of scrap. So when the traveling salvager Slam Streever visited Blizz's clan to offer Jawas work as "ferrets" on exotic salvage missions, Blizz leapt at the opportunity. He spent several years with Slam's crew, and later with the White Maw pirates, before being imprisoned by the Chiss Ascendancy on Hoth. When the Grand Champion of the Great Hunt freed Blizz from his cell, he vowed to follow his new friend and prove himself useful. After the Grand Champion's disappearance, Blizz returned to Hoth to form a crew of his own, hunting bounties and salvage with his usual enthusiasm. The mighty Wookiee gladiator named Bowdaar has spent over a century facing countless opponents without ever losing a match. He solidified his title as the galaxy's greatest gladiator when he defeated notorious Wookiee-hunter Karssk on Ord Mantell. The more gullible underworld scum whisper that Bowdaar is an immortal creature who can't be killed, but those who have faced him and lived know that he is simply the best there is. On the surface, Bowdaar may seem like a simple-minded brute, but nothing could be further from the truth. Case in point: Bowdaar eventually discovered the identity of the Trandoshans who first captured and enslaved him. One night in an arena on Loovria, Bowdaar learned that his former captors were sitting in the stands. An unfortunate "weapons malfunction" caused the drunken Trandoshan slavers to meet an untimely--and extremely messy--end. Broonmark is a unique creature among the Talz. While his peers spent their youths learning survival skills and playing on the frozen tundra of Alzoc Three, Broonmark developed a fascination with death. As a child, Broonmark watched his father killed by one of Alzoc Three's predators, and instead of sadness, Broonmark felt only shame at his father's weakness. Violence became an obsession and point of pride for Broonmark; he started hunting in secret and lived for the rush of a kill. When the Republic began recruiting Talz for their elite commando units, Broonmark eagerly volunteered for the chance to turn his claws against more challenging prey. But with each kill, Broonmark's desire for carnage and bloodshed intensified. His clan soon challenged his brutal leadership, and Broonmark watched in anger as the gentle Talz he fought to empower mutinied against him. Corso Riggs is a cheerful, disarmingly optimistic mercenary soldier. Raised as a rancher's son on the rough frontier of Ord Mantell, Corso developed a mixture of naive innocence and primitive toughness, wrapped with old-fashioned chivalry. In addition to his gung-ho enjoyment of a good, dirty fight and his encyclopedic knowledge of weapons, Corso remains a ray of sunshine in even the worst circumstances. He has no sense of his own mortality and is absolutely convinced he's going to live forever. Corso also has a soft spot for damsels in distress, even when it's clear they're up to no good. Doctor Eckard Lokin is a man of many secrets. While it's known he worked with Imperial Intelligence during Operation: Red Cell, there's very little concrete information on Lokin before the Great Galactic War. He found his true calling researching the rakghoul plague on Taris. In one of his experiments, Lokin used himself as a test subject and introduced a variant of the virus into his own DNA--giving him the ability to take rakghoul form. Lokin left Taris with Imperial Agent Cipher Nine to become the Cipher's doctor and continue his research on the rakghoul virus in hopes to improve the stability of his rakghoul form. When Cipher Nine vanished at the start of the war against Zakuul, Lokin decided it was time to officially retire and has spent the last few years in the Alderaanian countryside. A highly talented field medic, Elara Dorne was born Imperial and served in the Empire's military for two years before defecting to the Republic. She has since served with distinction as a search-and-rescue squad leader before being recruited to join Havoc Squad, an elite Special Forces unit sworn to protect the Republic. When the Commander of Havoc Squad went missing at the start of the Zakuul invasion, Elara Dorne searched tirelessly for them before being forcibly removed from Havoc. Thanks to her flawless operational record, she was selected to advise Supreme Commander Malcom, head of the Republic military. The son of refugees made homeless during the Great War, Lieutenant Felix Iresso has been a career soldier for many years. His file shows participation in several notable battles, including the so-called Eight-Hour Invasion of Dubrillion where Republic forces repelled an Imperial invasion force with minimal reinforcements. Since then, Lieutenant Iresso has earned excellent technical scores and commendations for exemplary service. However, his file also contains some discrepancies. Lieutenant Iresso has one of the highest transfer rates in the Republic military, serving under almost a dozen commanders across the galaxy in two years. The lieutenant has also been overlooked for promotion several times. The only explanation from his superiors is a reference to an incident on Althir where Lieutenant Iresso was captured by the Empire, but no details are given. Formerly the notorious smuggler and confidence man Tyresius Lokai, Gault Rennow briefly enjoyed a relatively paranoia-free lifestyle as an unknown gun-for-hire. But old habits are hard to shake, and Gault soon found himself a target of the Grand Champion of the Great Hunt. After convincing the infamous bounty hunter to spare him, he joined the Grand Champion as a right-hand man. When his new employer mysteriously vanished, Gault went back to doing what he does best: making money and getting into trouble. With his new partner Vette, he racked up a brand-new list of offenses and enemies. He currently maintains a tumultuous relationship with the infamous smuggler Hylo Visz. A failed Jedi Padawan who abandoned his training, the enthusiastically greedy Guss Tuno prefers the underworld lifestyle's potential for material riches. In a perfect galaxy, Guss would spend his retirement lounging in a heated swimming pool surrounded by exotic beauties while consuming a steady diet of fresh fish and expensive cocktails. Originally from Alderaan, Jaesa was a former Jedi Padawan who possessed tremendous strength in the Force, including the unique ability to discern a person's true nature and intentions. She was a firm believer in the Jedi Order until she met the Emperor's Wrath, after which the flaws and shortcomings of the Jedi were finally exposed to her. She joined the Emperor's Wrath as their Sith Apprentice and embraced the dark side, travelling the galaxy to carry out the Emperor's will. After the disappearance of her master and the Eternal Empire's subsequent invasion, Jaesa carried on alone, her power in the dark side growing as her hatred and feelings of abandonment festered. Once in a millennium, a man or woman is born who expands the frontiers of what Force users can achieve. Proud, young Jedi Padawan Jaesa Willsaam discovered the unprecedented ability to discern any being's true nature and uncover a person's most secret intentions. Born to a family of servants on Alderaan, she was brought to the Jedi Order and trained by Master Nomen Karr. But Nomen Karr could only protect and shield his Padawan from the world for so long. Through the machinations of Darth Baras, Jaesa was drawn away from the protection of the order and confronted by Baras's own apprentice--and with the emotional instability of her Master. Having now seen the darkness within the Jedi Order, Jaesa has left its corruption behind completely to help transform the Empire from within. She has searched her whole life for something to believe in, and her new teacher has provided the answer. Prizing freedom and anarchy above all, Kaliyo Djannis has always done precisely what she wants. She spent her adult life jumping between unsavory jobs, including for the Hutt Cartel and the Exchange. Willing to lie, cheat, and steal to get her way, she racked up a long list of enemies and ex-lovers. When Cipher Nine landed on Hutta to make a deal with Nem'ro the Hutt, Kaliyo temporarily put everything aside to join the agent and work with Imperial Intelligence. After Cipher Nine's disappearance, Kaliyo went back to freelancing around the galaxy. When she eventually grew bored, she landed on Zakuul and began targeting government and civilian buildings in terrorist bombings. Her activities drew the citizenry's attention, earning her the nickname "Firebrand" and sparking the first real flames of rebellion. Once a loyal servant of the Sith Lord Tulak Hord, Khem Val was placed in a stasis chamber in the tomb of Naga Sadow centuries ago by his master for safekeeping. Tulak Hord is long dead, but Khem Val lives on; a terrifying nightmare from the ancient past. Powerful, cunning and ruthless enough to slay even the strongest Force-users, Khem Val was trained as an elite assassin. After emerging from his long slumber, the Dashade is the very embodiment of death and destruction; a reminder that there are things even Sith and Jedi must fear. Although once pledged to a life of service, with his original master gone, it is uncertain where Khem Val's true loyalties now lie. A near-perfect killing machine, he could prove a valuable weapon for anyone willing to take him on... though he is a weapon that can cut both ways. M1-4X is a highly advanced war droid designed and built specifically to serve in Havoc Squad. As such, his engineers programmed him to be a perfect soldier: completely loyal, fervently patriotic, and willing and eager to go to any length or face any risk to destroy the Republic's enemies. M1-4X's armor plating, weapons systems and processing power are significantly advanced over typical military droid standards, due in large part to his unusual power core. Constructed by an unknown organization, the core was recovered during a classified operation and has output capabilities far beyond conventional models. After his commanding officer went missing in action, M1-4X's boisterous patriotism made him a perfect fit for the press corps, where he continued his work on improving soldiers' morale. His fiery speeches and heroic tales from Havoc Squad has made M1-4X a legend among the Republic ranks. Not one to let fame go to his circuits, M1-4X's only comment on his newfound notoriety is simply, "All in a day's work!" At first glance, Mako's relationship with Braden seems more like that of a father and daughter than members of a team of professional bounty hunters--and that assessment wouldn't be too far off the mark. Orphaned and homeless but with an uncanny instinct for computing, Mako had been living as a freelance slicer in the shadows of Nar Shaddaa's underbelly... until the day Braden pulled the girl bleeding out of an alley, and paid a street surgeon to patch her blaster burns. Recognizing talent and trouble when he saw it, Braden took Mako under his wing and has been looking after her as his own ever since. But while Mako loves the old man more than anything, her independent nature is beginning to chafe under Braden's protectiveness. An officer in the Imperial military, Malavai Quinn is loyal to the Empire and everything it stands for. When his career was abruptly halted by a mysterious disgrace, he served the powerful Sith Lord known as the Emperor's Wrath. Quinn later betrayed the Wrath at the command of his true master, Darth Baras. The Wrath ultimately forgave his crimes, and Quinn vowed to earn back their trust by helping overthrow Darth Baras. When the Wrath went missing at the start of the Zakuul invasion, Quinn's rescue efforts ended with him imprisoned by enemies within the Sith Empire. Empress Acina restored him to service and groomed him to serve her as advisor and confidante. A native of distant Sarkhai and daughter of Senator Tobas Grell, Nadia Grell is a newcomer not only to the Republic, but to the entire concept of space exploration. Surrounded by new species and strange cultures, Nadia is eager to experience everything she can. She became interested in the intricacies of galactic diplomacy while traveling alongside her father, and often acted as his assistant during talks. As she revealed on Attis Station, Nadia is also strong in the Force; unusually strong, in fact. As Force sensitives are relatively unknown on Sarkhai, Nadia's untrained powers left her shunned and feared by her own people. Senator Grell's decision to take her with him when he left Sarkhai was motivated by the hope of finding others like her in the Republic, and perhaps discovering some way for her to control her incredible talents. While few who are not Force sensitive in the Empire have any choice but to join the military, Lieutenant Pierce joined eagerly--not out of a sense of duty but out of a lust for action. In fact, although his soldiering and bravery are beyond question, he has faced resistance and scrutiny throughout his military career due to his occasionally reckless attitude and his disdain for authority. Pierce thrived during his service to the Emperor's Wrath and even led a successful operation capturing the Bastion on Corellia. But when the Wrath vanished, the Moffs decided a war hero like Pierce was too valuable to lose in combat. They promoted him, then reassigned him to a desk job at the Outreach Bureau, where he could act as an idol for the new recruits, much to Pierce's chagrin. In contrast to many Trandoshans, Qyzen Fess rejected the path of a mercenary to become a hunter of the galaxy's most dangerous beasts. Earning "Jagannath points" with every honorable kill, he has traveled for years, seeking worthy prey and honoring his goddess, the Scorekeeper. His simple habits and devotion give him common ground with the Jedi, though many disapprove of the attitudes and instincts that come naturally to a Trandoshan. Qyzen believed the Barsen'thor was the Scorekeeper's Herald and was the Jedi's loyal companion for many years. During the hunt for the Sith Emperor, Barsen'thor disappeared, leading Qyzen to believe his master had been called to the Scorekeeper's side, and he was left to return to the hunt alone. Petty criminal, starship mechanic, woman of mystery, royal queen: all of these terms apply to Risha, daughter of notorious crime lord Nok Drayen. Considering her upbringing as a violent gangster's child, it's a wonder Risha turned out remotely normal. Wise and experienced beyond her years, she has led an adventurous life containing some extremely dark chapters. Despite her biting sarcasm and general selfishness, one can never shake the feeling that Risha would be a better person if only she knew how. Years spent among the galaxy's dregs have fostered layers of personal self-defense mechanisms and a cynical shell around her. Only the most persistent friend has any hope of meeting the "real" Risha hiding beneath the surface. SCORPIO is an enhanced artificial intelligence who claims to have been designed for heuristic self-improvement by unknown parties. Her current chassis is of recent design, suggesting multiple precursor bodies or an independent database. Over a century ago, SCORPIO became involved with the Star Cabal organization and accepted guardianship of Megasecurity Ward 23 on Belsavis. In return for rare technology, SCORPIO willingly acted as the Star Cabal's security system until application of control codes by Cipher Nine. 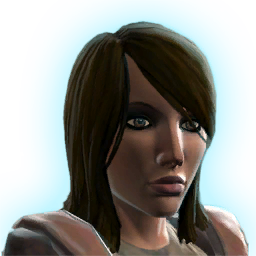 After Cipher Nine's disappearance, SCORPIO assumed a new identity as an information broker on Zakuul: the Lady of Sorrows. Her slicing skills and ruthless tactics quickly garnered the Lady both a reputation in the Old World and the attention of the Knights of Zakuul. Despite her growing list of enemies, SCORPIO remained one step ahead of her pursuers, moving her base of operations from neighborhood to neighborhood before settling in Breaktown. Although she clearly holds a grudge against Arcann, she keeps her motivations and long-term plans to herself. A career gangster and psychopath, Skadge had been enjoying a prestigious position at the top of Coruscant's most wanted list when a joint police, military and SIS task force managed to finally capture him. Deemed impossible to control or reform, the murderous Houk was secretly ushered to the only facility capable of housing him: Belsavis. Little is known about T7 before the droid came into the service of the Jedi. Certain features of its construction hint at it being a custom model built some time ago, but there are no official records to substantiate the theory. Regardless of its origins, the droid's enthusiasm and willingness to put itself in harm's way leave little doubt as to its loyalty. Despite T7's ties to the Republic, the droid readily agreed to work with Sith Lord Lana Beniko after Arcann attacked the Core Worlds and its master went missing. Because of T7's unthreatening appearance, it's often overlooked, making the droid a perfect informant and ally in the fight against the Eternal Empire. Unlike many Imperial Reclamation Service officers who are career soldiers with only a passing interest in history, Lieutenant Drellik throws himself into his work, studying with experts in the field such as the illustrious Professor Auselio Gann and galactic historian Deravon Wells. To Talos, the Imperial Reclamation Service does an invaluable job, preserving Imperial and Sith history against the onslaught of time. Talos's skills as an archeologist were first noticed by the Dark Council when he served the councilor in charge of the sphere of ancient knowledge. After his master disappeared, the Council ordered him to return to the Reclamation Service to lead an expedition on Yavin 4. Resourceful, cunning, and loyal, Raina Temple strives to be the ideal officer. When her latent Force-sensitivity manifested as a child, her Imperial Agent father sent her to the Chiss Ascendancy to hide from the Sith and suppress her abilities. Temple eventually joined the Chiss Expansionary Defense Force, and later the crew of the infamous Cipher Nine. When Cipher Nine disappeared during the war with the Eternal Empire, Temple rejoined the Ascendancy and trained Chiss agents in Imperial espionage tactics. At the same time, she used the Ascendancy's resources to track down her former mentor. Loyalty, honor, tradition: Torian Cadera embodies the Mandalorian ideals. He serves his leaders with a fierce allegiance, yet the shadow of his father's defection to the Republic has hung over him for most of his life. As a result, Torian's relationship with his fellow Mandalorians is complicated, and he's had to prove himself time and again to overcome the Cadera stigma. But those who could look past his family found a noble warrior who eventually joined forces with the Grand Champion of the Great Hunt. When the Grand Champion went missing after the rise of Zakuul, Torian returned to the Mandalorians and volunteered for the most dangerous strikes against the Eternal Fleet, leading successful infiltration and surveillance missions. His skill and dedication let him rise in the ranks and gain the trust of Mandalore the Avenger herself, earning him a place by her side. Background (Summary): Second-generation Imperial; mother native to Jurio, married Captain Adronik Hyllus after Jurio was granted Imperial governance. Expressed desire to join Diplomatic Service at an early age and displayed appropriate traits. Ranked high academically during training, and soon after graduation was granted (by request) post aboard exploration and first contact vessel (see service record). Reassigned to Alderaan due to diplomatic manpower needs (see House Thul). Served ably until encounter with Killik species and subsequent "Joiner" transformation. Current status is unclear. Personality: Vector Hyllus has repeatedly expressed admiration for Imperial accomplishments while indicating a desire to spread Imperial influence through diplomatic channels. His attitudes were likely shaped by the Imperial reconstruction of his homeworld and are appropriate for a Diplomatic Service member. Hyllus is obedient, intelligent, charismatic and effective. He is unlikely to advance further within diplomatic or military hierarchies. Notes: Personality profile compiled from performance reports from before Hyllus's "Joiner" transformation. Data should be considered non-comprehensive. A Twi'lek born into slavery on the planet Ryloth, Vette escaped a life of servitude to become an accomplished rogue and treasure hunter. She spent time in her youth stealing for the notorious crime lord Nok Drayen before going into business for herself after his death. Too daring for her own good, she managed to breach Imperial defenses and sneak onto Korriban, gaining entry to the most sacred Sith tombs before getting caught. Her second stint in slavery landed her in the service of the Emperor's Wrath, who she followed on a violent path of revenge. When the Wrath went missing at the start of the Zakuul invasion, Vette pulled a few odd jobs before joining up with roguish smuggler Gault Rennow. The duo scammed their way through the galaxy, making credits and enemies wherever they went. A Kaleesh warrior captured by the Empire in battle and brought to Korriban to train as a Sith, Xalek prefers actions to words. Before even reaching the Academy, he killed several of his fellow slaves who were also intended for training--a bold statement by any measure. Xalek melds his training as a Kaleesh warrior with a firm belief in the Sith Code. He kills without remorse and is an expert student of lightsaber technique and martial combat. Xalek left Korriban to become an apprentice to a Dark Council member, whom he served until his master's untimely disappearance. He took advantage of the chaos from the Eternal Empire's invasion to hone his skills and grow his power. After being given the title of Sith Lord, he decided to travel the galaxy to test himself in new ways. Even in an organization as diverse as the Republic Army, Yuun stands out. A member of the Gand species, Yuun is a Findsman, a shamanistic tracker held in very high regard among his people. He applies his unusual training to technical tasks of every kind, resulting in a success record unmatched by any other technician in the military. As effective as his methods are, they rarely meet with understanding or approval from his fellow soldiers, but he found a home in Havoc Squad. When his commanding officer went missing, Yuun searched Wild Space for a year, finding nothing. Saddened by his friend's apparent death, he left the Republic military to study the technology of Zakuul and follow a new path. "Zenith" is the code name of a Balmorran revolutionary fighter who has made a career out of hurting the Empire. Once a member of a powerful resistance cell broken up by Imperial infiltrators, Zenith has struck out on his own, gathering followers from Balmorra's oppressed population to launch sneak attacks, raids and bombings against the occupying Imperial forces. You have recruited Jaesa Willsaam to your Alliance. After all this time, you've realized that you're on different paths and opted not to recruit Jaesa Willsaam into your Alliance. You have decided that after all this time you love Jaesa! You have started a romance with her. After reuniting with Jaesa and beginning a new stage of your relationship, things have changed and you no longer care for her in the same way. Stuns the target for <<1[%d/%d/%d]>> seconds. Whirl your lightsaber hitting all hostiles 4m around the enemy target dealing <<1>> weapon damage to up to 5 targets over 1.5 seconds. A precision strike to a target with less than 30% health, dealing <<1>> weapon damage. A powerful strike to a single target, dealing <<1>> weapon damage. Places a force shield around the target, preventing a moderate amount of damage for up to 20 seconds. Executes a quick force heal on the target, healing for <<1>>. Heals a friendly target for <<1>> health over the duration of the channel. Detains the target in a Force stasis field for up to 10 seconds. Damage to the target causes this effect to end prematurely. Targets may only be affected by the Force Detain once every 30 seconds. Target must not be suffering from periodic damage and have greater than 90% max health. Taunts attacking enemies forcing them to attack your companion and generates a moderate amount of threat. Smash the ground dealing <<1>> internal damage to up to 5 enemies 5m around the user. Generates a moderate amount of threat and reduces incoming damage by 50% for 10 seconds. Does not hit sleeping, lifted, or incapacitated enemies.